What’s a Dirty Little Secret in your industry? Is there a way to exploit it or debunk it as a myth? Home → Uncategorized → What’s a Dirty Little Secret in your industry? 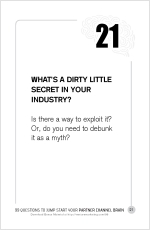 What’s a Dirty Little Secret in your industry? Is there a way to exploit it? Or, do you need to debunk it as a myth? Dirty little secrets are not limited to TV soap operas and Perry Mason’s defense of Harlan Merrill in The Case of the Renegade Refugee (a terrific episode, btw). If you’ve ever interviewed for a job where a rosy picture is painted for you and then, after joining the firm, experience Hell on earth, you know what I’m talking about. There are dirty little secrets that are just plain illegal. Case-in-point: age discrimination. 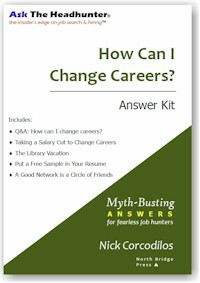 In a PBS interview, Nick Corcodilos, host of Ask The Headhunter® and author of How Can I Change Careers? was asked about the pervasiveness of age discrimination in larger corporations. As it turns out, it’s one of the “dirty little secrets” most people in corporations know exists but won’t acknowledge publicly. Nick offers terrific advice in his interview and is worth checking out if you are of that certain age and seeking new horizons. People who know an industry’s dirty little secrets roughly fall into two categories. On one hand you have the modern-day carpetbaggers. These are the guys who promise the moon during the sales process and get away with it because customers are just plain naïve and trusting…to a fault. You see this all the time with web hosting companies that promise unlimited bandwidth and storage for $4.99/mo and get away with it because 95% of all websites have so little traffic the upper, unlimited bounds never get tested. Once you do, say during a new product release, you realize you’ve been taken for an expensive ride on the road of missed opportunities with prospective customers who couldn’t get to your web page on launch day. On the other hand there are authentic, subject-matter experts who provide real-world insight. These are the folks who let you finish your sentence and then—almost like a best friend—explain your misguided logic and assumptions. What do you do if you are one of the heroes? The good guys? How can you help Prospects without sounding like a know-it-all or industry critic? So that you have a case study to follow, I interviewed Rocco D’Amico, president and co-founder of Computer Recycling USA. Known for their process, procedures and detailed documentation, Computer Recycling USA securely disposes of IT assets for F1000 firms and any company with valuable brand equity. Their clients would suffer negative legal, financial and reputation consequences if customer or user-data was somehow compromised in the process of disposing and recycling hard drives, servers, laptops and desktop PCs. Bottom line: Their clients don’t want to be the lead story on 60 Minutes. Ever. Not today or 10 years from now when a “destroyed” hard drive magically reappears on eBay (with the original data intact!). What’s the dirty little secret in your industry? The dirty little secret in our industry is that there really are no standards for how equipment is recycled or data is destroyed. There’s very little regulatory guidance. As a result, the asset disposition industry is a little bit like the Wild West with everybody developing their own standards. What we did was to engineer standards for data security and for asset disposal. In terms of data security, we also engineered various techniques and methods of going about and finding data, actually destroying the data and proving we destroyed data. That’s very unique in our industry. I thought Sarbanes-Oxley and HIPPA set standards for this. No? [Sarbanes-Oxley and HIPP] require folks to protect the data, for disclosure, but they don’t enforce the methods of doing it. There really is not a lot of guidance in Sarbanes-Oxley about how to go about it. Ultimately, if something goes wrong you need to be able to prove you did the right things with it and that you were conscientious. That’s where the gap is in the industry. What’s the big surprise customers tell you, when they compare previous vendors they’ve worked with in the past? Basically, they didn’t know what they didn’t know. Just by going through our extensive process and seeing our reporting and understanding the reasons… the “why’s” behind what we do… they get a raised level of awareness. They’ve gone from an exposed position to a protected position…that’s the bottom line. They just feel much better because they have much more control over their processes because of it. How have you used this “dirty little secret” to properly educate Prospects, so they avoid making mistakes? They usually say, “I don’t know” or they say “We have a certificate of recycling.” And then we dig into that and show them that the documentation that they’re getting is not sufficient for what they’re going to need if they have to go into a courtroom. Sure. We show them what they got and then we compare it to what we provide. And then we go right through it step-by-step, discussing what this piece does and how this piece would be used…and so forth. Most of it comes down to documented proof as opposed to a certificate that’s just a promise that [the recycler] did what he did. Is there any reason why your Channel Partners can’t carry your message to end-customers? Is your industry’s dirty little secret too dark or too complicated for them to understand? Perhaps controversial, but this IS the dirty little secret in world of Partner Channels—that a vendor’s underlying subject-matter expertise—the “thing” customers really and truly want to buy—is often shrouded in layers of gunk. So much so, that by the time the core message reaches end-customers, all suppliers do sound the same. And when this happens, it IS virtually impossible for Channel Partners to lead with your product and open conversations with the kind of Prospects best suited for you. Instead, why not train your Channel Partners to be your industry’s myth-busters? What would happen then? Is there a downside I’m not seeing?